Proceedings of MRS Meetings have been a staple of materials research libraries since the series started in the early 1980s. 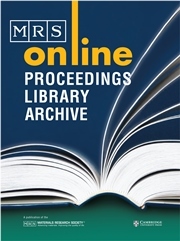 In addition to many titles still available in print, the MRS Online Proceedings Library Archive includes more than 100,000 peer-reviewed papers online—proceedings published from Volume 1 through the 2015 MRS Spring Meeting. The Archive is fully searchable and can be sorted and viewed by meeting or topic.